Google Chrome OS - do we want another monoculture? Of course, Google trotted out its boilerplate about how it's merely trying to make life better for Joe Netizen. Asked about the role of advertising in the new OS, Pichai dodged the question. "We are fortunate that as the web gets better and people use the web more, it benefits us as a company," he said. Asked if this was Google going head-to-head with Microsoft, co-founder Sergey Brin went so far as to imply the project had no business aim whatsoever. "Call us dumb businessmen," he said. "But we really focus on user needs rather than think about strategies relative to other companies and what not." It's worth noting that once again, Google has chosen to introduce a major product during a big week for Redmond. But the official line is that Chrome OS is no more than a gift to you. "There's a real user need to be able to use computers easily," Brin said. "We believe the web platform is a much simpler way, where the machines are essentially stateless or cache-like." The new OS shuns not only local applications but local data. Pichai did indicate there would be ways of caching data locally. This may include audio and video, ebooks, music, and games. And web applications that tap the caching standard built into the fledgling HTML5 will offer (limited) offline access as well. Even then, it would seem that devices will be rather tongue-tied when they lose their net connections. But Pichai played down such talk. "Our point is very simple: If your cloud is down, it affects any computer you're on. If you're using webmail on another machine, you still lose webmail." Of course, when net connections die, other machines can still run local apps - and access a hefty amount of local data. What's more, web-based applications have yet to reach the same level as desktop apps. And Pichai acknowledged this. At least initially, Chrome OS is intended for a limited audience. "There are applications today that are not available on the web," he said. "There will be some things this will not be able to do." Clearly, this is not an operating system for, say, high-end gaming. But Google is working to provide audio, video, and other so-called rich media. Like the Chrome browser, the operating system supports the fledgling HTML 5 video tag as well as Adobe Flash. And engineering director Matthew Papakipos said Google is "doing a lot of work with codec hardware acceleration. It's not enough to run things through a traditional decoder. We're also working to hardware accelerate those as much as possible wherever possible." 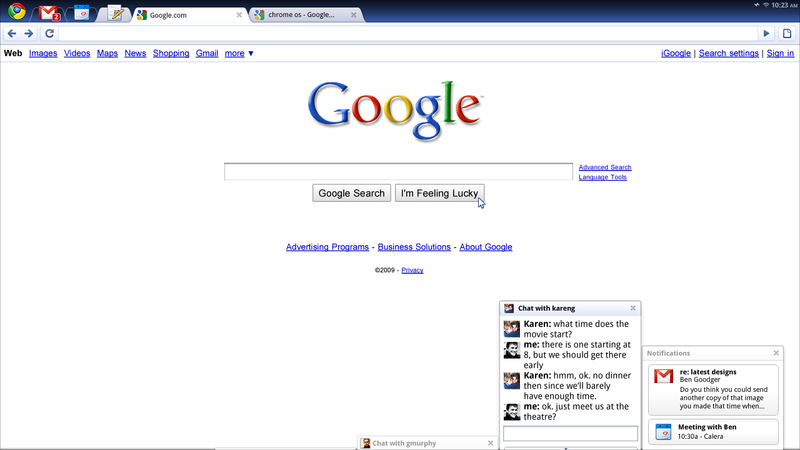 In short, everything that runs in the Chrome browser will run in the Chrome OS. Not that anyone expected anything else. Today, the OS does not support Microsoft's Silverlight. But Picai said Google is working to build additional plug-ins for the platform. Printing? He said the company is exploring some "innovative printing technologies." But these are not yet in place - and he did not elaborate. All of which raises the question: How is any of this different from running today's Chrome browser on today's netbooks? Well, Google has tweaked the browser interface a bit, adding specialized tabs specially for applications - and a kind of application control panel. Plus, there are other in-browser panes that pop with certain web apps. But the UI is still very much up in the air. As it stands, Google has merely offered up a few "user interface experiments" as part of the open source project. At this point, the biggest difference is that the OS doesn't run local apps - and doesn't run with all hardware. In this way, Google says, it's working to improve both speed and security. In shunning hard drives, it's reducing boot times. And in shunning local apps, it's attempting to lock down individual services. The OS confines each web application to its own sandbox. Google is also hoping to improve the security of the OS itself. The goal is to build a platform that can check its own integrity and reload itself as needed. Update: This story has been updated to clarify that Chrome OS will run on both x86 and ARM machines.